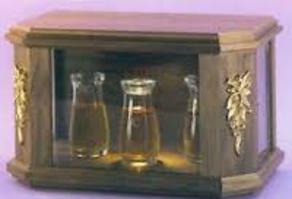 The word ambry is derived from the Latin armarium (cupboard or chest) and signifies the place where the vessels of oil used in celebrating sacraments are kept. These oils are blessed by the bishop at the Mass of Chrism celebrated during Holy Week and are brought to each parish church for the various rites of anointing. The three oils signify the universal charisms of the church for initiating (oil of catechumens), healing (oil of the sick) and consecrating (chrism). As early as the sixth century, ambries were used to hold consecrated communion bread as well as the oils, and were often located in the base of the altar. By the thirteenth century, separate locked ambries were used for the eucharist only. This was an accepted practice by the sixteenth century, when this separate container was called a tabernacle. In the meantime, smaller amounts of the oils were stored in the sacristy, or in a simple wall niche or recessed cupboard known as an ambry. As with all other vessels used in the liturgy today, the vessels for the oils should be of a quality and design that speak of the importance of the ritual actions. 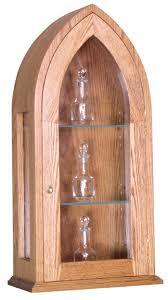 The vessels should hold an ample supply of the oils, thus symbolizing the generosity of God's gift. The gestures of anointing can then be performed with similar generosity of touch. The display of beautiful vessels reminds the community of the reverence it gives to its members as they are welcomed in baptism, confirmed in the spirit and anointed in their illness. To be anointed is to participate in an ancient biblical and ecclesial rite of blessing, and to enter into the mission of Jesus Christ, the anointed one of God.